금동보살입상(金銅菩薩立像)은 청동 불상 표면에 도금한 불상으로 간송미술관에 전시되어 있다. 머리에는 인동무늬 비슷한 장식이 새겨진 보관(寶冠)을 쓰고 있으며 얼굴은 긴 편이다. 얼굴의 표현은 매우 특징이 있는데, 가늘게 찢어진 눈과 앞으로 내민 입술, 툭 튀어나온 광대뼈가 어울려 토속적 인상을 강하게 풍기고 있다. 삼도(三道)가 없는 긴 목, 원통형의 몸은 삼국시대 불상의 특징을 반영하고 있다. 옷자락은 양쪽에 대칭으로 뻗쳐서 새의 날개깃처럼 표현하였는데 매우 인위적이고 도식적이어서 사실감이 없다. 양 어깨에 걸쳐서 내려오는 큼직한 구슬장식은 허리 밑에서 X자 모양으로 교차되는데, 너무 밑으로 쳐진 느낌이다. 도금이 많이 벗겨져 있는 대좌(臺座)는 원형으로 단층이며, 끝이 비교적 날카로운 8잎의 연꽃무늬가 조각되어 있다. 경상남도 거창군에서 출토되었다고만 전해질 뿐 확실한 유래는 알 수 없다. 양쪽으로 뻗쳐진 옷주름 표현, 구슬장식, 두 손으로 구슬을 잡고 있는 모습 등에서 6세기 말이나 7세기 초의 특징을 보인다. 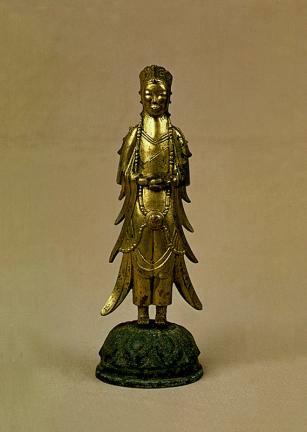 This gilt-bronze Buddha statue is displayed at the Gansong Art Museum. It is wearing a crown with honeysuckle patterns and the face is relatively long. The face is unique with its Korean expression of narrow long eyes, pouting lips and high cheekbones. 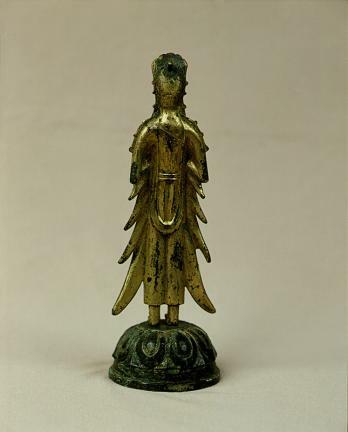 The long neck without the samdo (the three realms of existence where evil people go) and the cylindrical body reflects the Buddha sculpture style of the Three Kingdoms Period. The robe is symmetrical and looks like fins. Overall, it looks artificial and unrealistic. The large beads that hang from both shoulders and come down to the waist are crossed over in an 'X' under the waist. The single story pedestal is carved with a sharp eight-petal lotus flower. The gilding is almost all gone. It is said that it was excavated in Geochang-gun Gyeongsangnam-do, but the definite origin is not known. The spread out clothing, bead decorations and posture of hands holding the beads show this piece was made during the late 6th century or early 7th century.